The annual FWD Dinner and Gold Medal Awards was held on the 28th November at the historic HAC, home of the oldest regiment in the British Army. And what a night it turned out to be for Today’s Group members! 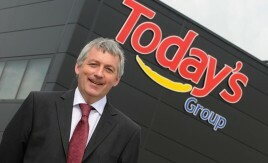 Mark Windebank is owner and managing director of Savage and Whitten, the largest independent wholesaler in Northern Ireland. Mark is a board member of Today’s Group and now takes over as our Chairman replacing the much respected Rodney Hunt. We caught up with our energetic new Chairman Mark Windebank to ask him about Today’s Group plans and to pick up some great business building advice for independent retailers.